Introvert inspiration is something I’ve been seeking for a while now. I feel like every time I do something that is supposed to inspire me, I wind up getting drained of energy and feeling like I need a whole month of just drooling in front of the TV before I feel the urge to create something again. It took me forever to realize why that was, and it’s because I’m an introvert. (Cue the chorus of eye rolls about introvert think pieces. I feel you. But, like 98% of opinions, I simply don’t care.) The thing about being an introvert is that large crowds of people are draining. So attending a conference or a reading can be inspiring, but equally draining at the same time since there are so many people present. And I’ve found that in a lot of cases, those crowds tend to cancel out the inspiration. That’s why I’ve come up with this list of foolproof methods of introvert inspiration. It may differ wildly from other creative advice you’ve received, but I can attest that these things have always worked well for me. The thing for me is that when I’m in the middle of a project, I’m not ready to discuss it. It’s still largely in my head. And while I think writing groups and critique partners are great, I know that I can’t use them for inspiration, motivation, or accountability. I have to let the idea fully gestate in my mind and notebooks first. Then, when I’m done and have fully wrapped my head around what I’ve created, then I can take it to a writing group, and not a minute sooner. And that’s the thing about introverts. There’s a lot going on in our heads, and we like to keep it there until it’s something we’re ready to share. I’ve also noticed that if I share too soon, I’m susceptible to suggestions that can completely derail a project, as was the case with the first two book manuscripts I’ve ever written. You’ve gotta let the idea grow until it’s ready. Which brings me to the next point. For the first few years of our relationship, Chris would ask me what I was thinking about. He’d usually do this while I was staring off into space, existing somewhere that’s a million miles away from where I actually was. And when he’d ask, I’d have no idea what I was thinking about. And that’s because I spent a lot of my time (and I still do) inside my own head. That’s where the ideas come from, and that’s kind of the basics of introvert inspiration anyway. I once tried to express to someone that whenever I hang out with people, I feel like I’m not really a part of what’s going on — that I’m actually just a bystander who is watching. It’s kind of a weird feeling, to be alone in a room of people, but that’s pretty much where I honed my skills of staying inside my own head. To that end, if I’m not inside my head, I’m 100% distracted. That’s why I struggle with getting anything done at a coffee shop, where there’s so much noise and movement. So, for an introvert to be inspired, I would like to assert that you must stay inside your head. Don’t look too far outward. That way lies fragmented thoughts and chaos. Get a cup of coffee with a friend. No. We hate being in large crowds of people where we can’t have meaningful exchanges. We also hate not having any alone time to recharge after we’ve spent time with people. But if you’re like me, a great source of introvert inspiration comes from simply chatting with a friend. And what better way to chat than over coffee? There’s definitely something spiritual about hearing what your friend has been up to. I like to just hear what they’re working on, and let them know what I’ve been up to. I guess, for some, this would fall under the “accountability” thing. But I like my coffee dates to not come with requirements, deadlines, or agendas. It’s just a nice time to see a good friend and sip on some introvert inspiration. One of the best ways to zone out in your own head is to do something with your hands. I can’t explain the love I have for painting my nails. It’s not because I’m trying to look cute or anything. It’s all because the act of carefully painting each nail is a great stress reliever for me. Sometimes, I’ll sit and make notebooks. Or, I’ll draw mandalas. The thing about inspiration is you tend to need it when you have all this pent up creative energy that you can’t use toward your usual pursuits. But using that energy to do something with your hands is always a great way to reset your mind in a quiet way, and prepare yourself to get back to the original reason you needed that inspiration. 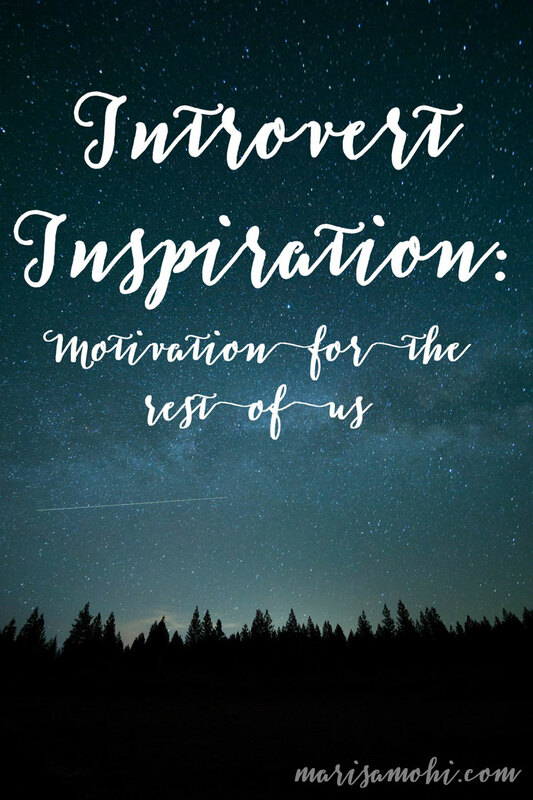 Why is it you don’t feel inspired? Is it the task at hand, or is it something else? If you’re procrastinating because you don’t want to do something, then maybe it’s time to admit to yourself that you don’t want to do it. I have a tendency to flake out on projects when I absolutely cannot make myself do them because I absolutely do not want to do them. But, if you find that you are putting off something you actually want to do, try to figure out why that is. It could be that you’re overwhelmed with other things, and don’t feel you can zero in on the task you want to complete. I get this feeling all the time, and the distracted feeling of needing to procrastinate is really common for introverts. Instead, try to cut away as many distractions as possible, whether by turning off phone notifications or putting yourself in a quiet space. Once you understand what is causing you to procrastinate and killing your inspiration, you can eliminate it execution-style and get it out of your way. Step into your personal time machine. When I need a dose of introvert inspiration, I go back to a time when I felt the most inspired. As an undergrad, I walked around in my Chuck Taylors and Levis with a small Moleskine in my back pocket. I always had it on me. I spent a lot of time on my favorite bench just writing down thoughts and fragments and bits of poetry before attending either my fiction writing or poetry writing classes. Luckily, I work on the campus where I went to school. So, when I’m feeling out of it, I just do the things I used to do as an undergrad, and it usually snaps me out of my funk. But if you can’t go back to the places you associate with your most inspired time, there are other ways to go back in time. Think about sensory information — smells, sounds, and tastes you associate with what you consider to be your most inspired time. I guarantee that you can go back to that time with a specific candle, or song, or even a drink. Remember what I said about staying in your own head? Well, headphones just ensure that nothing else can get in your head so there’s only room in there for you. Your only real friend is a notebook. There’s just something about a blank page that begs to be written on. So, when I’m in dire need of some introvert inspiration, I sit down with a notebook and bash out all my thoughts. Clearing your head so there’s room for more thoughts is the best way to make space for inspiration. So tell me, what do you do when you need some inspiration?